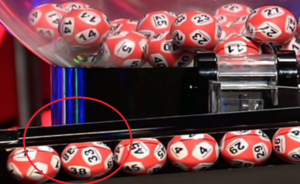 a lotto ball appeared to show two different numbers during a live TV draw. the lottery balls featured both the numbers 33 and 38. “Strange what’s happening, is it ball 38 or 33?” questioned one. “Well it was 38 then magically changed to 33,” another noted. numbers on it and nobody realised,” said another tweet.